First, make the slaw. Mix all the ingredients except for cabbage together in a large bowl. Add the cabbage and combine and refrigerate for 30 minutes to marinate the flavors. Next up, schnitzel time. Place a large piece of plastic wrap on a cutting board and place the chicken breasts down, spaced a few inches apart. Cover the chicken with more plastic wrap and pound to about ¼ inch thin with a mallet or heavy pan. Put the flour, whisked egg and matzo meal each in a separate shallow bowl. Season the flour with 1-teaspoon kosher salt and add the sesame seeds to the matzo meal. Heat ½ inch of oil over medium heat until 375 degrees F.
Meanwhile, coat each chicken breast in flour, shake it off, then egg, drip it off, then matzo meal. Tip: Use alternative hands for the dry and wet dipping for less mess. Fry chicken breasts in oil for 2-3 minutes per side or until golden brown. Blot the chicken on a paper towel and sprinkle cooked schnitzel with a little more salt. 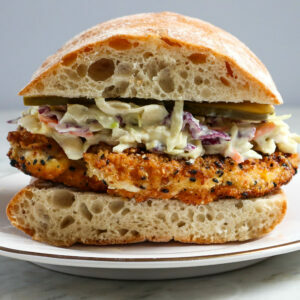 Serve on sliced baguettes with pickles and slaw!